Hello Monday! Although I would much rather be lazy snuggled up in my ridiculously comfortable bed I did have to get up and head on down to work. It seems that the longer the summer goes on the more challenging my 5 A.M. wake up call becomes. This weekend started for me last Friday, I work a compressed schedule and I get every second Friday off, which normally ends up being reserved for running errands and getting things done around the house, but this Friday I decided to relax a bit. So after heading over to the gym for an early workout i started preparing lunch. 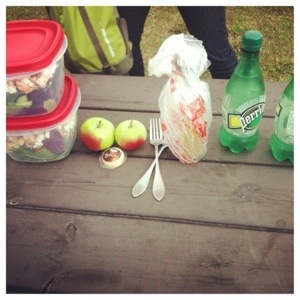 Last week it was a dear friend’s birthday and we hadn’t been able to celebrate so we schedule a lunch date and I went to visit her at her office with a little picnic. I made us some salad with the organic baby kale I finally managed to find in the store and we sat outside and chatted for a bit. After lunch I headed home and opened up some course books that arrived, my course (more on the course later) doesn’t start until the end of September but I am a nerd like that and like to get started early. Then I finished my afternoon off with a long chat with one of my sisters. It felt like a great Friday and I felt so rested by the end of it. Saturday morning started pretty early for our house as we were having an old unsafe chimney removed. To get out the house and move around for a bit I went on a short bike ride and ran some errands. Once I got home I parked myself on the deck and was back in my books. Sunday I woke up bright and early and got myself ready for the farmers market and a nice little 7k tempo run. This weekend had been so perfect temperature wise and I had the chance to run my favorite path on the south side of town. After my run and grocery shopping my husband and I did a little quick gardening and running of errands before deciding that it was time to relax and enjoy the rest of our weekend. We decided to watch some classics like “the man in the iron mask” and “not without my daughter” before sitting down to a delicious meal of BBQ chicken and zuchinni with roasted potatoes. All in all a pretty great weekend and the best part is now it is less than a week before my sister comes to visit and before gingersneezes run club’s first 10k race!!! This entry was posted in General, Health and Fitness and tagged friends, personal training, reading, recap, relax, run, Running, study, weekend by healingginger. Bookmark the permalink.